More chats with builders for Rupert Clubb, of East Sussex County Council and Transport for The South East. Where are we with RIS2, currently in draft form, the second round of spending on the "Strategic Road Network" ? It's been allocated £23.5bn funding in the Budget, partially secured by ring-fencing Vehicle Excise Duty. 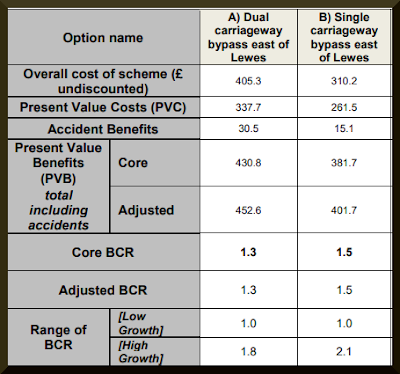 That's when we might find out more about the plans for an offline dual carriageway between Lewes and Polegate. Lewes MP Maria Caulfield told me she would publish the bid documents once they were all in. No sign. The South Downs National Park Authority has decided to drop its pursuit of a Judicial Review of Highways England plans for the A27 at Arundel - and good old Highways England is picking up the lawyers' bills. So far, Highways England show no signs of behaving any better with their plans for the A27 East Of Lewes, despite many invitations to share their calculations. Will it always take threats of Judicial Reviews to get things out in the open ? "Transport for the South East (TfSE) held a reception at the House of Commons on Tuesday (31 October), sponsored by Huw Merriman, MP for Bexhill and Battle and a member of the Transport Select Committee. Rupert Clubb, director of communities, economy and transport at East Sussex County Council and chair of the TfSE Senior Officer Group, told Transport Network there had been a very positive response from the local MPs who attended. There are 11 councillors from across the south east on the board of TfSE. 8 are Conservative (though one of them is non-voting), 3 are Labour. Fans of Rupert Clubb will be delighted to learn that he will, after all, be taking the stage at the Highways UK conference in Birmingham next week, in a session enticingly titled "The road ahead – the rise of the Sub-national Transport Body". Rupert finds time to be Chief Officer of Transport for The South East, as well as the day job as Director of Communities, Economy and Transport for East Sussex County Council. Here's the set up for the session, with my annotations: Transport for the North, Midlands Connect, Transport for the South East and England’s Economic Heartland are each developing long-term strategies that are underpinned by a dedication to improving quality of life across England [and backing, for example, big new roads which have clear red warning signals on environmental impact and bio-diversity]. As economic regions, we share a collaborative, evidence-based approach to transport investment, bringing together an unprecedented coalition led by local authorities and business leaders. [Note: no mention of communities, residents, etc] We complement the work of local and national transport authorities, providing the leadership that enables strategic infrastructure requirements to be developed and delivered faster. Our partnerships achieve much more by working together than would ever be possible in isolation. The session is part of a Big Thinking series, in the Jacobs Theatre. Jacobs is a global engineering and construction firm headquartered in Dallas, with several current contracts with Hughways England and the Ministry of Defence. The panel is sponsored by CUBIC, a global technology and engineering company headquartered in San Diego, with quite a bundle of defence contracts, and rights to the Oyster Card technology around the world. Highways England should reply to my latest FOI by Bonfire Night, but I'm not holding my breath. 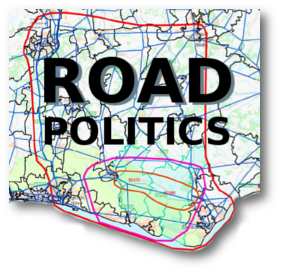 Maria Caulfield, MP for Lewes, has said that there's now a good business case for an new dual carriageway between Lewes and Polegate - but, so far, neither she or Highways UK are prepared to share it with mere voters. Here's the last publicly-shared Benefit-Cost Ratio analysis, from consultants Parsons Brinckerhoff, issued in February 2015. It simply didn't produced the multiples, at less than 2, that would 'demonstrate' value for money. particularly in a changing context driven by mobile internet access." Other elements adding uncertainty - electric cars, which might well produce higher numbers of shorter journeys. transparency and public confidence. "